One of the most popular causes we support at Barracuda is the Challenged Athletes Foundation. This organization, also known as CAF, was established in 1997 with the goal of helping people with disabilities enjoy active lifestyles through physical fitness and competitive athletics. There are many benefits to active lifestyles and participation in sports, including higher self-esteem, greater independence, and an overall improvement in the quality of life. Organizations like CAF help make this possible for many people who might not otherwise have these opportunities. And one thing CAF is best known for is the support and recognition they give to Team CAF Athletes. CAF has helped over 60,000 athletes since 1997, and they are about to send one more into the challenge of a lifetime. 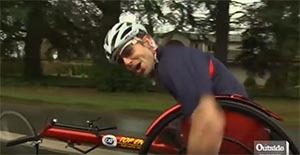 Andre Kajlich (pronounced Kye-leck) is a handcyclist and a veteran of several endurance races and Ironman competitions. On January 8 of this year, he became the first handcyclist to qualify for the Race Across America (RAAM) competition. This is a 3000 mile race across 12 states, with 170,000 feet of vertical climb. Individual racers like Andre have 12 days to finish, though most solo racers finish in 11. If Andre completes the race, he will be the first solo handcyclist to have done so. 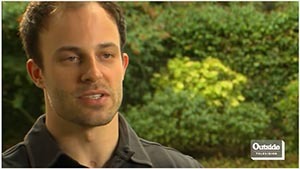 Andre grew up in Edmonds, Washington. He moved to Prague in 2003 to study Chemistry and was out for a night on the town with friends when the unthinkable happened. Three weeks later, he woke up in a hospital to find that doctors had removed both of his legs. He had been struck by a subway train, causing so much damage to his body that doctors weren't sure that he would even be able to sit up again. Andre wasn't sure how life would turn out for him as a double-amputee, but he spent his hospital time with others who were in similar situations. This is where he learned about competing in Ironman Triathlons. This is when he decided to overcome his injuries and take his body to the next level. Andres next challenge, the RAAM, is just around the corner. He will have a support van with him, which is where he will catch his 90 minutes of sleep each night and a few 30-minute naps during the day. His race diet will consist of calories from his drink mix and an assortment of high-carb snacks. While Andre is racing solo, he's not going it alone. He will have friends and supporters around the world following him via RAAM live tracking and on twitter @CAFoundation and @AndreKajlich. Andre's Barracuda friends will be watching and sending updates on his progress. We'll also be asking you to join us in supporting the Challenged Athletes Foundation with a donation to CAF. We believe in this organization, its mission, and its many athletes. If you would like to learn more about Andre and his preparation for RAAM, visit the Challenged Athletes Foundation website here. To learn more about Andre and his incredible spirit and amazing athletic journey, visit his website here.